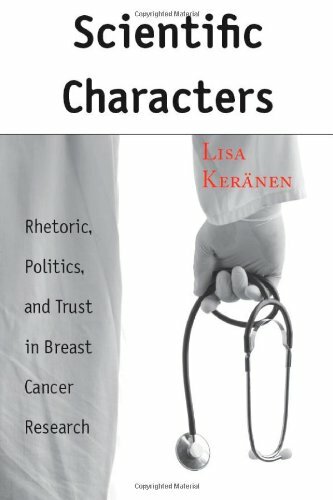 Scientific Characters chronicles the events of “Datagate,” in which a prominent breast cancer researcher and oncologist falsified patient data in a landmark clinical trial. Keränen deftly discusses the issues surrounding the people, specifically the scientific characters and personae, and handles the background information and the participants in a manner that is articulate, engaging, and insightful. Keränen begins the book and each chapter with a discussion of what is to come. In this way, she sets up a framework that guides the reader through the levels of her argument. The book begins with a discussion of the rhetorics of ethos, persona, and voice, each of which is critical to understanding the implications of the events surrounding Datagate. Thereafter, Keränen guides the reader through the personae of the main figures involved in Datagate. A general clinical trial design may compare a new treatment to an old treatment, but, for the sake of patient ethics, never allows patients to go untreated. One example is the use of a new cancer drug, which is compared to a conventional drug or another therapy, such as radiation therapy, if the drug is different than previous therapies. In this example, patients are randomly assigned into one of these two groups; trials are frequently “double-blind” studies, which means that the patient receiving treatment and the doctors in the trial do not know which drug the patient is receiving. In this way the placebo effect can be avoided, and the effects observed in the patient are considered to be more objective. The trial discussed in Scientific Characters was a prerandomized, unblinded study: patients were not randomly assigned to a treatment group, and they knew which treatment they were receiving. The B-06 trial compared the lumpectomy procedure (removal of a primary breast tumor) to the prevailing treatment of mastectomy, or removal of the entire breast. The researcher who falsified data was Dr. Roger Poisson, an oncological surgeon in a prominent research center in Montreal, Canada. In March of 1994, the first press report came out that Dr. Poisson had lied about patient data in a landmark breast cancer trial. Dr. Poisson was a major advocate of lumpectomy, or removal of a primary breast tumor, followed by radiation therapy and chemotherapy. The NSABP (National Surgical Adjuvant Breast and Bowel Project) B-06 clinical trial began recruiting patients in 1977, published its first results in 1985, and additional long-term results in 1988. The major findings of the B-06 trial were that lumpectomy followed by radiation and chemotherapy was as effective as total mastectomy in breast cancer patients. This was a critical finding for patients, who could undergo a much less invasive procedure without losing any of the anticancer effects. It was discovered that Dr. Poisson had altered over one hundred patient records by changing the dates of the patients’ surgeries, so that the patients could be included in the B-06 trial population. However, because of the guidelines that described which patients could be included in the trial, his alterations dramatically changed the time between the patient’s date of diagnosis and the date of entry into the trial; as outlined for the study, this time could be no longer than 28 days for the patient to enter the trial. Ultimately, because the trial recruited thousands of participants, the overall findings of the superiority of lumpectomy to mastectomy were unchanged. Dr. Poisson recruited patients into the B-06 clinical trial, and the overall B-06 trial director was Dr. Bernard Fisher of the University of Pittsburgh. As these two researchers separately faced battles both in the public eye and in front of a Congressional subcommittee on Oversight and Investigations, the quality and classification of their personae, or their actual and perceived characters, influenced the public perception of their scientific integrity. In such cases, Keränen argues, the quality of an individual’s persona can greatly influence the reaction to the person’s message. Throughout the events of Datagate, there appeared to be a focus on the persona of each researcher, rather than a discussion concerning the ethics and design of clinical trials. In examining Datagate, the reader is led through the varying personae of Dr. Poisson and Dr. Fisher, in addition to the other major figures in this drama: John Dingell, the congressman who was the head of the House Subcommittee hearings, and the patients involved in the B-06 trials. This latter group is of particular importance because of their reaction to the news of Dr. Poisson’s data falsification. A general concern persisted in these former patients, who wondered if they received the best treatment, despite the finding by multiple groups that the B-06 trial conclusions were unchanged. By deconstructing the persona of the scientific and nonscientific characters and their reactions, Keränen builds a thoughtful text that invokes questions concerning the ethics and current structuring of the clinical trial system. The reader will appreciate her careful and structured handling of the events, the characters, and the ethics surrounding Datagate.